Review by AllTheBestFights.com: 2016-11-12, some good exchanges between Martin Murray and Nuhu Lawal but it is not enough to get three stars: it gets two. The former interim Wba Mw champion Martin Murray entered this fight with a pro record of 33-4-1 (16 knockouts) and he is ranked as the No.15 super middleweight in the world but he lost two out of his last three fights, against Arthur Abraham in 2015 (via split decision, Abraham vs Murray) and George Groves (=Murray vs Groves). Between these two bouts he has beat Cedric Spera (=Murray vs Spera). His opponent, the undefeated Nuhu Lawal (who replaces Arthur Abraham), has a perfect boxing record of 23-0-0 (13 knockouts) and he entered as the No.24 middleweight. He has fought twice in 2016 winning over Soufiene Ouerghi and Istvan Szili (=Lawal vs Szili). 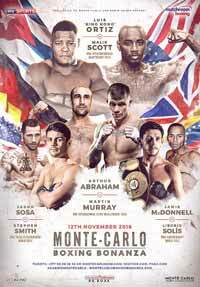 Murray vs Lawal is valid for the WBA Continental super middleweight title; undercard of Luis Ortiz vs Malik Scott. Watch the video and rate this fight!